« On this day Arsenal sold Adebayor for a £21m profit. 3 years on no one wanted him. Arsenal entered October 1924 in a very pleasing position in the league. Yes they had slipped down the 7th, but that was still much higher than their normal position a couple of months into the season, and they were just two points behind the top club and with a better goal average. However despite this improvement in form the club was not resting on its laurels and the local paper was not giving up on running a constant stream of (occasionally quite ill-informed) criticism of the management. Sometime on or shortly after 29 September Arsenal made an offer to Preston North End of £4500 plus Bob Turnbull, who had been transmuted from a full back to a centre forward, in return for Preston’s and England’s forward Tom Roberts. He had scored 118 goals in 199 games. But Arsenal either didn’t offer enough or north London did not appeal for instead of joining Arsenal, on 2 October Roberts signed for Burnley, wherein he scored 28 in 49 games before moving back to Preston. Now we have spent some time showing that Knighton’s famous dictum that Sir Henry Norris would not allow him to spend more than £1000 on a player was untrue, and was probably confused with Sir Henry’s long term campaign to get the League to limit transfer fees while removing pay restraint within football. This transfer, had it gone through would have been the biggest, in terms of profile and expenditure in Arsenal’s history. So how could Knighton have forgotten about it? Certainly the move was not blocked by Sir Henry – the offer was made and the newspapers clearly reported that the player said he wanted to stay nearer his home time rather than there being a financial problem. As the story was breaking however, the Islington Daily Gazette continued its attack on Knighton’s selection policy coming back to the issue of Haden who had played for the reserves the previous weekend rather than in the first team. The argument was put that the management always chose to play players out of position rather than bring forward reserves who were doing well in the Combination. This time the criticism was made in a letter, and the Gazette was normally reluctant to publish such readers’ letters (which apparently it got each week by the bucket load) criticising the club (letters to the paper being the early 20th century equivalent of phone ins). Yet this was a curious statement to make and a curious letter to choose as a centrepiece of attacking Arsenal. Of all players who were played out of position, Turnbull was the prime example of how this strategy could work. In 1921/2 he played four times at left back and then once at centre forward. The next season he played seven at left back and one right back, and then played 27 games at centre forward and scored 20 goals. Voysey moved from centre half to inside right. Baker moved from right half to inside left. But less we think this was just a Knighton thing we can for a moment skip forward to 1925/6 when Herbert Chapman, a man who had just won the championship twice, and was now Arsenal’s manager. 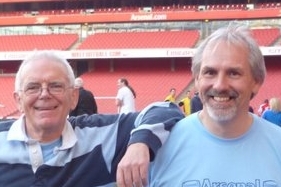 The club finished second in the league – their highest ever position and during this one season alone Chapman moved Bob John from left half (a position in which he had played 81 games for Arsenal) to left back – and later back again. He moved Brain from inside right to centre forward. Neil was moved from inside right to inside left. Blyth from inside left to left half and Baker from left back to right half. Lots of managers did it. It was part of the game in the 1920s and into the 1930s. For the evidence shows that moving players positions was what was done and could be done with success. On this occasion it was not Knighton who out of phase with the times (although I am less certain about his personal skill in moving players around) but, and not for the first time, the correspondent in the Islington newspaper. Sally Davis in her reporting of Henry Norris’ whereabouts at this time reports that he was, on 2 October, at a key meeting of the Feltmakers Company, and that was the last time he was noted in public in the year. What we don’t know is if he was keeping a low profile, or had once more left the country for France. Only the minutes of the directors meetings would tell us if he was in London on the occasion of those meetings, and the club has chosen not to make these public. But there are only two options. Either Sir Henry had again left the country to winter in his villa in the south of France, or he was deliberately keeping a very low profile. And in either case we are seeing once more the evolution of a new Sir Henry, a man who didn’t feel the need to be at the heart of everything, to take personal control, to be at the centre. He was now past 60 (and remember this was the 1920s, when life expectancy was shorter) and he had been very ill. He had pulled out of politics totally, and out of his main business interest of property development. Whether he was in London or in France, he was stepping back. And so we must turn our attention to the football in October 1924, with Arsenal’s first game of the month against Blackburn. Having replaced the two wingers for the game against West Ham, Knighton now reverted to team that he had played in six of the first seven league matches. Blackburn were 10th in the league but had performed well away from home thus far, with two wins, one draw and one defeat. But Knighton called the matter right with his team selection, and he duly got another win 1-0, with Neil scoring. Despite being 5th in the league at this point, Arsenal were not in the top five for goal scoring; but they could reflect that Huddersfield, who were top, had only scored one more goal than Arsenal. With ten goals from eight games Arsenal were solidly mid-table in regards to goal scoring. Also interesting is the fact that the scoring of the goals had been shared out. Woods had four, Rutherford and Neil had two each, Butler and Ramsey one each. The following Thursday Arsenal played an away friendly against Clapton Orient. I can find no written evidence to back this up, but I suspect this came about as part of the deal for Arsenal to sign Dan Lewis from the O’s on 26 August. Sadly, for once we don’t even have a record of the team, although we do know that Blyth played and scored both goals for Arsenal, which suggests that as with his one league appearance thus far he was playing in the forward line (he had played left half for part of the previous season when John will injured). Certainly it would have made sense to play the reserves in this game because the next league match on 11 October was against the top team in the country and current champions, Huddersfield Town away from home. But if Knighton did take that course it did not help matters. 2-0 down at half time, Arsenal lost 4-0. It was not Arsenal’s worst defeat in the campaign – that unfortunately came at Highbury – also against Huddersfield, in a match which as we shall see later, had a particular significance beyond being just another league fixture. Knighton made three changes for the match, presumably because of injuries (as we have noted, anything said in the local paper on such an issue needs to be taken with several bucket loads of salt). Once more the two wingers (Toner and Rutherford) dropped out and in came Blyth and Haden. Haden had played 31 times on the wing but Blyth had not appeared on the wing since a number of unconvincing displays two years before. Also out was Baker and in came Mackie who had played at right back in 31 of the 42 games last season. 15,000 attended the match which saw Huddersfield heighten their grip on the top of the division, It was below their average for the season which was 17670. Rather poor for the champions who ultimately retained the title. Apart from the myth of a newly reborn Arsenal under Knighton being seriously questioned in the light of recent results, called, there was concern that in the last three games Arsenal had scored one and conceded five. Indeed the three defeat s and two wins in the last five league games was more in keeping with the results generated in previous seasons than that of a newly reborn Arsenal in 1924/5. But still, Huddersfield were the champions, and the league leaders, and next up was a home game with a less formidable opposition: Bury. Arsenal were 8th and Bury were 14th going into this game, Bury not having won a single one of their five away games thus far. But they changed that around, beating Arsenal at Highbury 1-0, despite Knighton reverting to his original XI who had won four, drawn one and lost just one of the opening six of the season. The Bury match was even more disappointing than that single result, in that it was the start of a run of three successive home league games for Arsenal (having ditched the plan of playing the same team home and away in successive matches, the fixture committee had not yet found a way of balancing home and away games under the new approach). It may seem hard to credit from our 21st century perspective but the Bury game was thought to be the toughest of the three that followed the Huddersfield game, for the following arrivals at Highbury (Aston Villa and Tottenham Hotspur) were considered more beatable. 40,000 turned up for the next game on 18 October against Villa which saw Turnbull come back at centre forward. Butler, playing as always at centre half, got the goal. Turnbull I think was added to the side in order to secure his sale, for this was his final match. (This was a common ploy, given that obviously there was no TV footage to be seen managers or coaches would often ask to see the man they were thinking of signing play, resulting in out of favour players getting a game. As we know he had become a prolific scorer for a while (with 22 goals) after being switched from fullback to centre forward. He was sold to Charlton Athletic shortly after this game. That gave a little more self-belief to Arsenal ahead of the Tottenham game the following Saturday and 51,000 came to Highbury for the match. Tottenham were sitting two points further down the table than Arsenal and had lost three of their six away games, scoring six and conceding seven in the process. It looked like a solid defence and a snatched goal from Arsenal’s secret weapon could do it. So it turned out, although before the game not too many would have known what Arsenal’s secret weapon actually was. It turned out to be their signing from Ton Petre who had been playing in the reserves for the past year: Jimmy Brain. Not only did he play for the first team for the first time, he also scored the one and only goal of the game. This was in fact the first of 125 goals in 204 games. But not many of his goals would have been like this one. The report suggests the ball hit his head, knocked him out, and went into the goal. He later became a player and coach at Tottenham and subsequently learned the error of his ways and returned to Highbury as an Arsenal scout. In all he scored 125 goals in 204 games and in 1925/6 his 34 league goals in one season was a club record. He continued with the club through much of the Chapman era and won a league winners’ medal in his final season of 1930/1. The Times report on the Monday after said that this Arsenal were unlucky not to have scored more. So there was now just one more game for the month – the first round match in the London FA Cup; a 2-0 win over Chelsea at home. Arsenal put out their first team – indeed exactly the same XI as played against Tottenham on the Saturday. The result was the same (an Arsenal win, although this time 2-0) and one of the goal scorers was the same. Brain had now played two, scored two. Woods got the other. The month ended with the general election on 29 October. This election is notorious in history for the Zinoviev Letter The “Zinoviev letter” published by the Daily Mail on 24 October. It was a fraudulent document that purported to be a directive from Grigory Zinoviev, the head of the Communist International (Comintern) in Moscow, to the Communist Party of Great Britain, ordering it to engage in all sorts of seditious activities. Whether the Letter or the widespread opposition to Labour of the newspapers were to blame we cannot tell, but there was a major shift in power. Islington East which included Highbury moved from being a Liberal seat to that for the Conservatives. The Conservatives won 412 seats, Labour 151, and the collapse of the Liberals was confirmed as they sank to 40, having previously held 158. And by the end of the month Arsenal had achieved a first – it was the first time they were top of a league table. Not THE first division league table true, but A first division League table for having won five, drawn one and lost one at home, scoring eight conceding two they were top of the table when measured on home results. Their goal average was 4.00. Sadly away games also counted and with one win, one draw and three defeats, Arsenal were near the bottom of that league. Interestingly however at the very top of the away form league was Huddersfield Town who were unbeaten away from their ground. Either Chapman was refining the technique that was going to do him so well in years to come, or his team liked playing in front of a proper crowd. The full table at the end of the month saw Arsenal 7th. Not as high as had perhaps been hoped given the opening games, but still better than recent times. Cardiff who had challenged Huddersfield so strongly last season were now 16th, one place and one point above Tottenham. What is however noticeable is that Arsenal and top club Birmingham were lagging a long way behind the rest in terms of goals scored. And that brings us to one other issue this month, for sometime around now discussions started within the League and the FA about the decline in the number of goals scored. Now this is one of those stories that most people who are interested in football history know a little about but for which the exact details are incredibly hard to pin down. Virtually every book and every web site that mentions the change in the offside rule (which came in for the 1925/6 season) runs the same story with the same figures (goals totals across all four divisions), without citing a source, and that always makes me somewhat nervous. Rules have, since 1886 been made by the International Football Association Board which first met on 2 June that year. It consisted of the Football Associations of England, Scotland, Wales and Ireland. Each had a vote and I think, judging from what I have read, so they needed three of the four to vote in favour of a change – although I can’t find anything that confirms that for certain. It clearly was either that or a unanimous decision. When Fifa was formed in 1904 it agreed to abide by the rules of IFAB. Fifa finally joined IFAB in 1913 and had equal votes with each of the four original nations, which meant that the four British nations could pass a law change that Fifa didn’t like. That voting arrangement lasted until 1958. And at this moment there was this discussion concerning the fact that the leap in crowds post war had been lost and crowd numbers were going to to below the 1913/14 level – the last full season the first world war took its effects. In the table below we look at the goals conceded by Newcastle, the team who were considered to be the most adept at using the current “3 man” offside rule, compared with the goals conceded by the club that came 3rd that season, alongside the goals conceded by the club that came 3rd from bottom (thus just missing relegation by one place. The final column shows the average Division 1 crowd for the season. Now one of the great abilities of football in England is that of administrators, managers, and journalists to seize on one explanation for a changing situation and come up with the idea that “if we just do x everything will be ok.” Life is never like that, but it doesn’t stop people from imagining it is so. A number of reports suggest that some clubs had worked out the tactic of catching the opposition off side with a great deal of success, and Newcastle is often cited as the past masters of this technique of moving the defence up to the half way line as the opposition started an attack. One way to check this is to look at Newcastle’s total number of goals conceded across the years starting in 1905/6 when the league was increased to 20 clubs and also look at a few other clubs. I have chosen the clubs that came 3rd from the top and 3rd from the bottom of the first division, for clubs that come top or bottom often do so having outstandingly good or bad seasons, and are thus not representative of the league as a whole. So in the first column we can look at the goals conceded by Newcastle, the prime exponents of the offside law. We can this this had dropped considerably after the first world war, but after 1924/5 with the new law in place, they let in many more goals, despite winning the league in 1927. Similar patterns are observed by the 3rd placed, and third from bottom club. I have ignored the season 1925/6 immediately after the change of the rule since obviously in that year clubs would have been adjusting to the new rule, and there could be large differences depending on the astuteness of the players and manager. I’ve therefore jumped to 1926/27. I also deliberately ignored 1914/15, which was mostly played in war time, as clubs in different parts of the country lost greater or lesser numbers of players depending on circumstances. Thus we have three seasons before the war, three seasons post war before the change and three seasons after the change which we can compare. In each case the law change had its effect, there were many more goals. So all that looks like a grand success for the scheme. But… for there is always a but… the aim of the law change was to attract more people to football. And although there was a rise in the average crowd at first, by 1932/3 that had vanished and at no time did attendances get back to anything near the level achieved in 1920/21. Pulling the various factors together we might assume that there was a huge surge in attendance figures in 1919/20 and 1920/1 as men returned from war service. But it was not the excitement of goals that then made them subsequently turn away, for when there were more goals, they didn’t come back. I don’t have enough data to say what it was that took men away from football after that surge and didn’t bring them back, and indeed I doubt that anyone does, but I might guess at the poor facilities in the ground, the constantly negative attitude of the press towards almost all clubs, and the realities of family life of men who started their families upon demobilisation and now had other demands on their money and time. However another view has been put forward – that following the law change midfielders began to play long balls between the two defenders at the back, making the wingers more attacking players than mere ball crossers. This, it is said, combined with the move to introduce the centre half as a central full back made for more negative football. Personally I really can’t see this argument as valid. Clubs were experimenting with the third full back for several years before 1925, and the notion that Chapman was the first to introduce the plan at Arsenal is not supported by the facts. There is more to be said about this major change in the law, and I’ll come back to it at the appropriate moments during the season. We are currently evolving this series on Henry Norris at the Arsenal. The full index to all the articles is here. This index is updated as each new article is published. Perhaps the most popular element in the Norris story is that of Arsenal’s promotion to the first division in 1919. The most complete review of this, which puts right the numerous misunderstandings of the events of that year appears, and most importantly cites contemporary articles and reports, such as the minutes of the FA meeting where the promotion was confirmed, and the reports in local papers thereafter, is set out below in these articles. After that there is a complete index of all the articles in the series in chronological order. The first suggestion that Arsenal could be elected to the 1st division. Why did the clubs vote for Arsenal rather than Tottenham in March 1919? Exposing the second libel against Henry Norris: the summer of 1920. The 3rd Knighton allegation against Norris: did he sell much-needed Fred Pagnam just for profit? Did Henry Norris really beg Leslie Knighton to stay and offer him the hugest bonus ever? And if so, why were there no new players? May/June 1921: Knighton the fantasist. The fourth allegation. Why did Arsenal manager Knighton turn down Man City but not buy players? Summer of 1921. Arsenal in the Summer 1923: another Knighton allegation but the evidence is again against him. Anticipation a plenty but another terrible start to the season: August 1923 – the non-signing of Moffatt. As shown in this article Arsenal bid for £4500 plus a player for Tom Roberts for Preston. This was in the last season of Knighton’s reign as manager. Did he really “forget” this when writing his autobiography, or was it left out as an inconvenient fact? It is hard to avoid the latter conclusion.